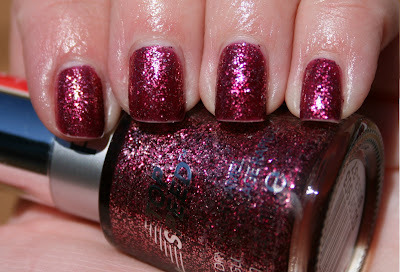 This is a dark pink jelly base jam packed with tons of pink glitter. The above swatch is two coats, topped with Seche Vite. The SV smoothed it out pretty well. I'm generally not a fan of the glitter polishes. They look so pretty in the bottle and are such a disappointment on the nail. This is really pretty though and I'd totally try this without any hesitation. So pretty!! I am loving glitters this year - they give such a girly pop! !